House Signs In Slate is part of Drew Memorials and we have been making Headstones, Memorial Plaques, Commemorative Tablets and House Signs for over thirty five years. Our memorial work can be seen all over Cornwall and Devon whilst our house signs are seen all over the country. We are based in Bodmin, geographically and historically the centre of Cornwall. Stone working has been in the family for over 6 generations and we now use the most modern techniques and machinery alongside the more traditional methods. 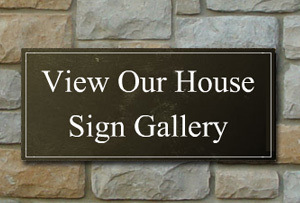 Our design department are happy to provide you with free of charge proofs for your sign, which can be invaluable in choosing the correct sign for your home. As we are a small family business and every sign is hand-made on site, we have the flexibility to produce your sign exactly as you want, including different sizes, colours, fonts and the ability to add colour designs. Call us for a quote/proof if you want something entirely personalised. We also make commemorative slate plaques, perfect for commemorating official occasions or openings. We only use the best quality 20 – 25mm thick slate. We don’t, as many of our competitors do, use cheap roofing slate while still charging premium prices. Our friendly team are happy to help with any enquiries or even to talk you through the ordering process, give us a call on 01208 76435.